Anti-patterns are practices that despite their negative consequences continue to be applied due to their low cost, ease of use and apparent good fit to solve pressing problems. It is possible to outgrow them by learning that a better way exists. While many organizations already learned how to take full advantage of business process management methods and tools, many still live in a world where email is the main (sometimes the only) tool used for internal and external communication, coordination and collaboration. Emails continue to provide a very fast and flexible asynchronous communication medium between two or more people, which however comes with many pitfalls. 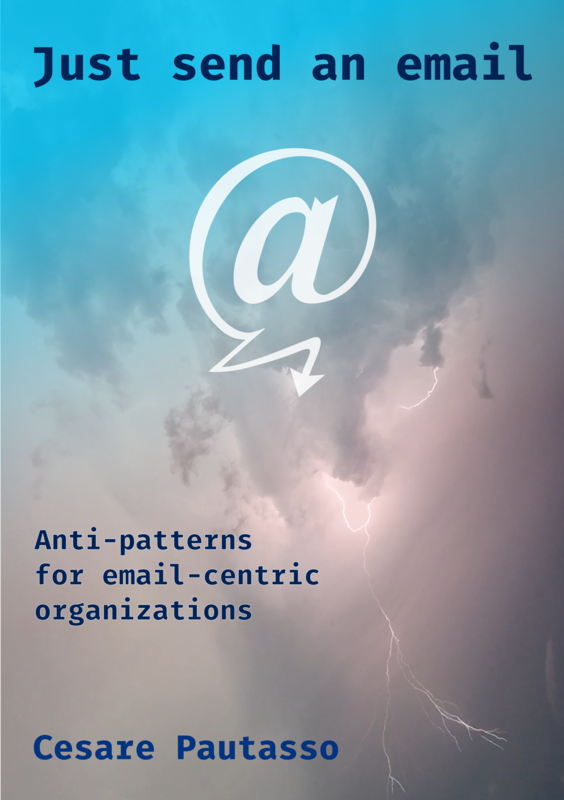 In this book published on LeanPub we present our ongoing work towards uncovering email anti-patterns which we have actually observed in the field. Some examples of anti-patterns we have uncovered so far are: Unsecured Sensitive Mail, Monday Morning Mail, 5pm Reply, Redirect, Re:gret, Ticketless Support, On Behalf, Fuzzy Link, Attached Body, Collaborative Edit, Datamail, Unintended Reply-To-All, Total Recall, Lightning Reply, Untimely Reminder, Mail from the Grave, Mail-Call-Meet and META SPAM.